Jose Mourinho sacked: Who will Chelsea turn to next? 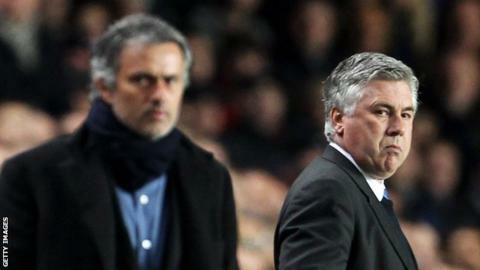 Is Carlo Ancelotti among those eyeing Jose Mourinho's old job? The king is dead. Long live, well, who? Chelsea's fans sang Jose Mourinho's name until the end, but ultimately their loyalty and a Premier League triumph seven months ago were no protection from owner Roman Abramovich's ruthless streak. Now their attention turns to the next man to ride the club's managerial bucking bronco. But who are the potential contenders? The pedigree name in the field, but Chelsea will have to battle their way to the front of a long queue of serious suitors. After winning titles by the cabinet load at Barcelona, the 44-year-old has kept a dressing room of big egos pulling in the right direction at Bayern Munich, taking the Germans to the Champions League last four in both his full seasons in charge. Chelsea would represent a different challenge as he was handed an excellent legacy to build on at both the Nou Camp and Allianz Arena. But few would back against him repeating his success. The good news for Chelsea fans is German newspaper Bild reported on Thursday that Guardiola will leave the Bavarian club at the end of this season. The bad news is he seems more likely to be heading to the north west than SW6, with Manchester United's long-standing interest and Manchester City's Catalan connection in the boardroom apparently more attractive than succeeding his great La Liga rival. The 45-year-old prowls the Vicente Calderon touchline in the style he used to run the Argentina midfield - a mix of passion, aggression and streetwise cunning. Barcelona and Real Madrid had won the previous nine Spanish titles heading into the 2013-14 season, but Simeone and his Atletico Madrid team broke their well-funded duopoly to lift the trophy for the first time in 18 years. They came within less than three minutes of an extraordinary double in that campaign - Real Madrid's 4-1 extra-time triumph in the Champions League final down, in no small part, to Sergio Ramos' dramatic leveller in the 93rd minute. Atletico are behind Barcelona at the top of the Spanish table on only goal difference, but Simeone may feel he has nothing left to prove and the time is right for a move. However, if he is unavailable until next summer, Chelsea face a dilemma as to whether to back an interim manager with funds and chase a Champions League place or risk writing off a top-four finish for the season. The only manager other than Mourinho to win the Premier League with Chelsea. The 56-year-old Italian led the Blues to the Double in his first season in charge, after being brought to Stamford Bridge for the start of the 2009-10 season. When he was sacked at the end of the following campaign, the Blues had finished second, nine points behind champions Manchester United, and made the last eight of the Champions League. If he salvages the same from this campaign, he would expect a healthy bonus rather than his P45. Abramovich might also be tempted by Ancelotti's enduring popularity in the dressing rooms he has worked in. He is still well liked at Real Madrid after clinching the club's landmark 10th European Cup in 2014 and would be a contrastingly calming influence after the turbulence of Mourinho's second spell. The abiding image of Hiddink's brief spell in charge of Chelsea is of the Dutchman with one hand on the shoulder of a beaming Abramovich, a cigar in the other, and the team's FA Cup celebrations as a backdrop. It was the end of a short, but sweet, three-month stint as he rejuvenated a club that had looked lost under Luiz Felipe Scolari, securing a Champions League place and beating Everton 2-1 at Wembley in his final game in charge. After getting the flak and sack for the Netherlands' dismal Euro 2016 qualification campaign, he may decide that, at 69, he can do without the pressures of another high-profile full-time role. But if offered another caretaker role, he would be a good candidate to keep the Stamford Bridge seat warm. As successor Harry Redknapp regularly reminded Tottenham fans, Spurs were four points adrift at the bottom of the Premier League when they dispensed with Ramos in October 2008. After such an undistinguished spell in charge of one of their great rivals, the Spaniard would be as unpopular an appointment among Chelsea fans as compatriot Rafael Benitez was in 2012. However, the Stamford Bridge hierarchy may believe that, like Benitez, he can be a steadying hand on the tiller. Ramos led Real Madrid back into the 2008-09 Spanish title race with a run of 16 wins and one draw in 17 matches after taking over midway through the season. The 61-year-old's combination of dressing-room discipline and attacking tactics was also successful at Sevilla and, out of work after leaving Ukrainian side Dnipro, there would be no compensation to pay another club. The reaction of Chelsea fans should Juande Ramos be appointed is easy to predict. What they would make of Brendan Rodgers taking over is less clear. The 42-year-old worked as a youth and reserve-team coach at Stamford Bridge for four years before leaving for Watford in 2008. His three years at Liverpool - a spell that only came to an end in October - make him irreparably damaged goods in the eyes of some of the Stamford Bridge faithful, but his stylish feel-good football and knowledge of the club and its rivals are definite plus points. A newspaper report on Tuesday claimed Rodgers was stalling on other offers in the hope the Chelsea job became available. Could it be time to lengthen the banner that adorns one end of Stamford Bridge? The 35-year-old defender is reaching the end of his playing days and, despite his lack of managerial experience, his deeds on the pitch would command instant respect in the dressing room. He passes intelligent and eloquent comment on the game in both news conferences and television studios - recently putting up a staunch defence of Mourinho before his exit from the club. He has spent holidays on board Abramovich's yacht in the past but, despite their good relations, it would be an huge gamble for the Russian billionaire to trust a rookie with guiding his club to calmer waters.